If your print workflow goals include increasing your print job efficiency, accuracy when accepting orders and communicating with clients, then optimizing your job submissions through a more streamlined and productive automated print workflow is the solution you’ve been looking for. Overall, your client develops increased confidence in your print organization due to timely and accurate job delivery. 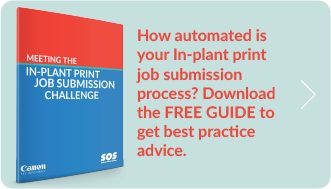 Get more information about automating you entire job submission process from this helpful guide: Meeting the In-Plant Job Submission Challenge. How do print job templates simplify and enhance print workflow? Here’s a summarized tour of some of the benefits to the CRD operation of using online job templates as part of your automated print workflow. Business cards represent one great example of a job type whereby the print workflow can be greatly simplified and sped up through the use of job templates. The online job templates for this type of product can offer the customer enough flexibility that they can feel they’ve got some control in the design of their cards, but branding, layout and, if applicable, legal copy won’t be changed. Using job templates also provides a reduced turnaround time for job completion, opening the door for last minute deliveries. That’s a fairly common request when it comes to business cards. Another common job template that can simplify the print workflow process is an invitation template. Again, the client is provided with a kind of “controlled flexibility,” but the proven elements of an effective invitation will still remain, no matter what. In the case of invitations for corporate events, controlled branding (such as correct usage of logos and corporate colors) is an obvious advantage, but other benefits include a far easier method of reordering and reprinting, as well as a reduced turnaround time and quicker time to market. Job templates can also enhance print workflow when it comes to variable data applications and non-print items, too. Documents like internal and external stakeholder reports, or any variety of company catalogs can be set up using templates. This ensures that all the appropriate data is there and it’s easy to read, but it also ensures that the material suits the appropriate audience. Cataloged items like corporate gifts (mugs, pens, backpacks, etc.) can also benefit from templates, and if a company has satellite locations and salespeople these items can be ordered online and delivered with location-specific elements printed on the articles. “Controlled flexibility” and incorporating job templates into the user’s ordering process is what saves them time and ultimately enhances the print workflow process. Users will be able to create their own unique products, but the variables will still be limited. This process will help reduce errors, make it easier to pre-flight jobs during submission and streamline the actual production time. By using a job template as part of the print workflow process, common problems like issues with resolution and readability are identified quickly. Those potential issues can then be fixed before a single letter of font is ever printed. All of that translates to a far more efficient process for the user. Let’s dive a little further into how exactly job templates can streamline and speed the print workflow process, as well as speed up the delivery time. We’ve already mentioned how templates reduce errors and delays due to mistakes and miscommunication. That obviously speeds up the production process, but templates also enhance the print workflow by promoting faster customer approvals for jobs. Another way to speed the process is to integrate order information into other business platforms, such as IT and accounting systems. With IT integration, print organizations can add quality control tools to the order process which cut down on costly errors. Order information can also be automatically integrated with a company’s accounting platform, making it easier to process, track and finalize orders and costs associated with each and every job. The result? You get a streamlined process with enhanced communication, a more efficient supply chain, faster proofing & delivery, reduced errors and ultimately a better end-product and a happier customer. An added benefit of a more streamlined process and faster delivery is your operation’s ability to take on higher volume jobs and projects that require a greater number of variables. When your print workflow is enhanced through automation, and the result is a better-balanced workload. Ultimately, a print workflow automation tool like online job templates allows for an organization to take on more work and do it more efficiently, all while reducing costly mistakes. We’ve reviewed a lot of the benefits of job templates to the print workflow process, but the simple summary is that templates ultimately simplify the job submission process. That creates a more efficient print workflow and improved productivity. Costs are more easily managed and customer satisfaction and loyalty goes up. If that sounds like the kind of action your print organization might want to get in on, contact Superior Office Systems to learn more automating your print workflow.